So daylight savings time had us ‘falling back’ a few weeks ago, and I’m still trying to adjust my cook times. In order to get all my food photos shot before the sun starts going down at 4pm, I’ve got to start cooking hours earlier. Sometimes as early as 10 or 11am, depending. Which can mean that for the vast majority of a day, my guys are all seeing and smelling the emerging fruits of my labor. Naturally the flavors permeate the air. I kid you not, it takes about 5 minutes before they come running- is it ready yet?! And then there’s the whining, the cajoling, the snarkiness when it IS ready- but ya can’t have any yet. Sorry, boys. This isn’t your first rodeo. I made it clear it was being made for the blog, meaning until pictures are taken, there’s nothing but a tiny tastin’ happenin. You’d think they were being subjected to some form of cruel & unusual torture, not that they just had to wait until supper time. I mean, I’d think they’d be happy. Days I’m not cooking for the blog? Dinner’s served at 7:30. Days I am? It’s ready between 5-5:30. It should be a win-win for everyone. Luckily for my ravenous little scavengers, I’ve always got some sort of fresh fruit on hand to tide them over. Even when it’s not what they actually want. They always take the healthy snack though! During holidays though, there’s no snacking. Everybody, even the kids, is willing and able to hold off on eating from brunch until dinner. 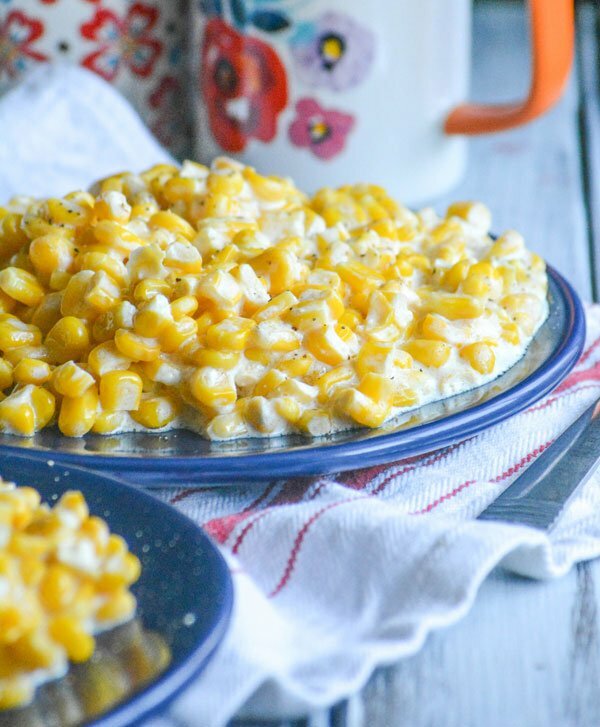 Nobody wants to miss an ounce of their family favorites that evening, especially not this Slow Cooker Homemade Cream Style Corn. Luckily for them, this is one of their favorite dishes they won’t have to wait on pictures to enjoy, just the clock. 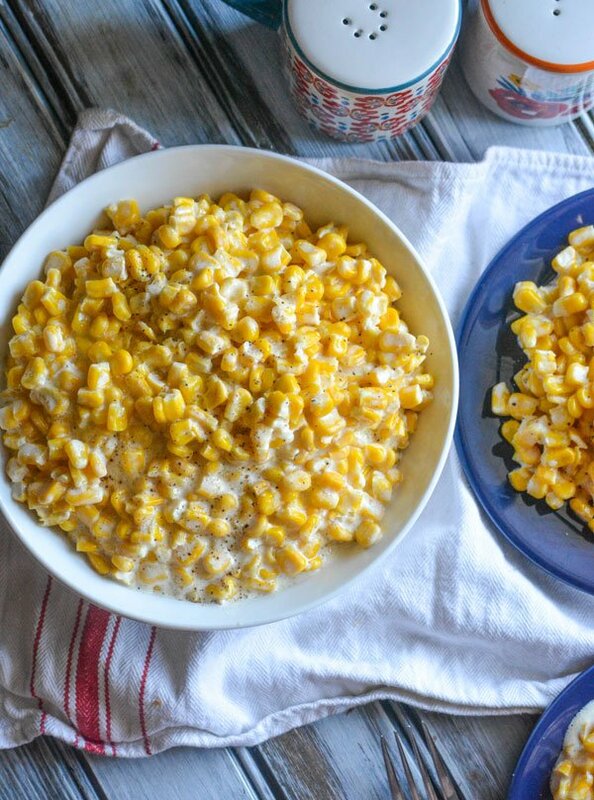 Golden corn kernels are served in a yummy cream sauce for a beautiful side dish that’s as easy on the eyes as it is the palette. 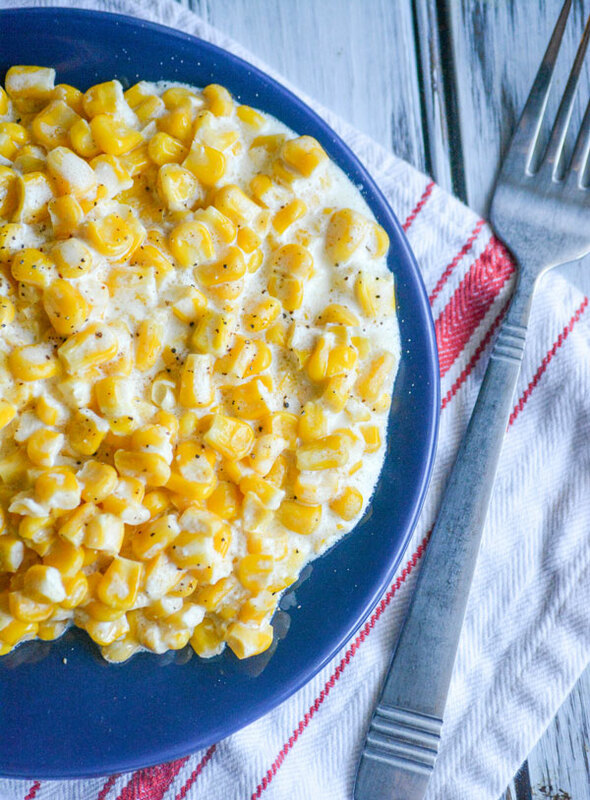 Just 6 ingredients, and your slow cooker, stand between you and this Slow Cooker Homemade Cream Style Corn. Kick the can, you will never regret it. 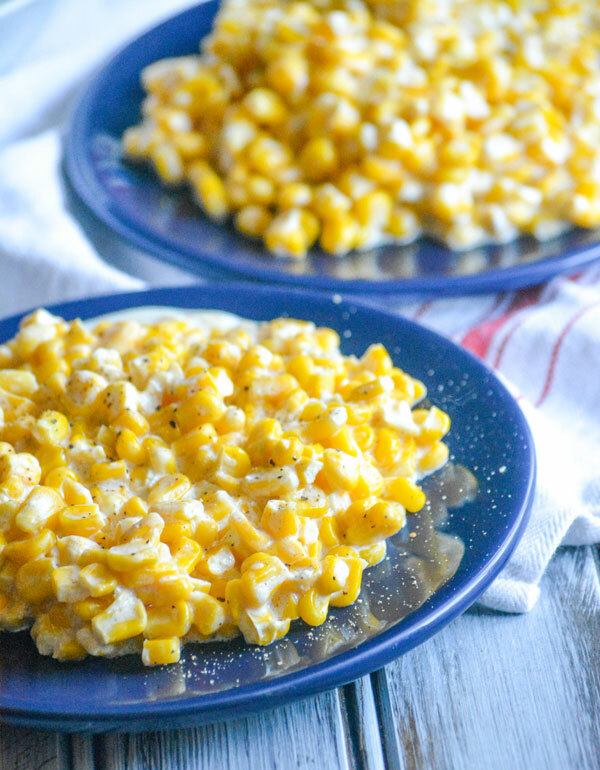 A slow cooked ,extra creamy version of a much loved Southern side dish. 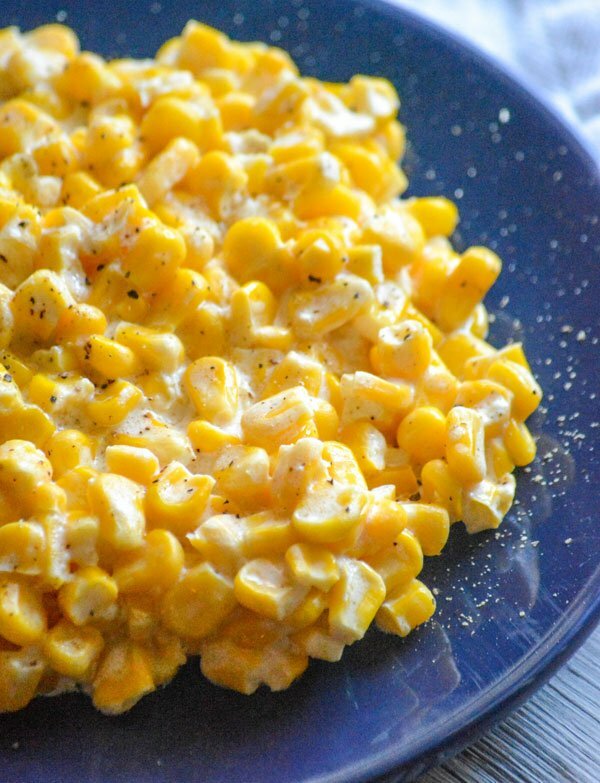 Add all of the ingredients to the bowl of a slow cooker. Stir to combine. 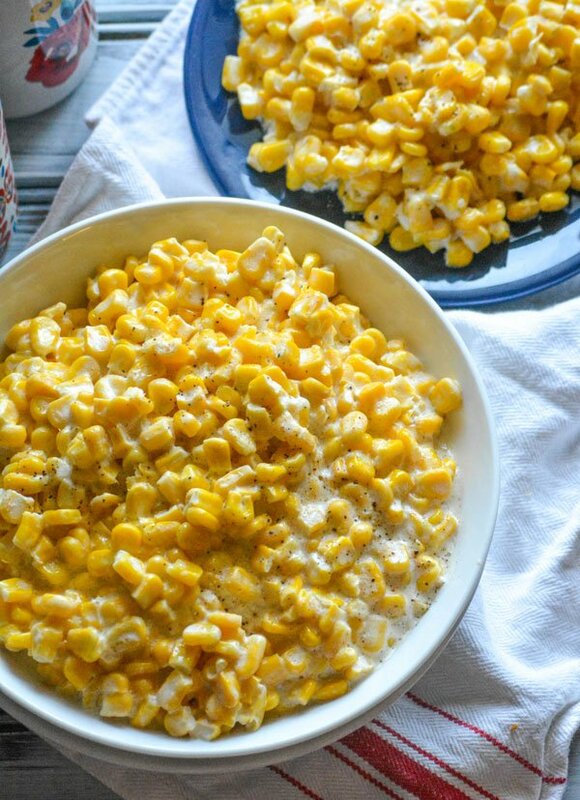 Cover, and cook the corn on low for 3 hours. Stir the mixture to evenly combine. Re-cover, and continue cooking an additional hour. Season with a little extra pepper, and serve! approximately will it serve? Plan to make for Christmas dinner. Thanks, Roylene! For us it serves about 4-6 with decent serving sizes. Thanks so much, it looks fabulous & my family is going to love it.